Velixo Reports is the only reporting tool of its kind designed exclusively for Acumatica. We used our extensive experience with Acumatica to craft a user-friendly Excel plugin that is lightning fast and leverages the unique capabilities of your cloud ERP. Connect using your Acumatica login credentials and start building Excel spreadsheets that instantly include Acumatica data. Velixo Reports adds a ribbon to Excel and more than 45 functions that are specially designed to work with general ledger and project data. You’re always working with the most up-to-date data. Changes you make to formulas and cells are reflected immediately in your spreadsheet. Easily update the cell to see the P&L of another branch, or run it for a different financial period. To track travel expenses for a project over time, just copy the column to the right and every formula will follow. In brief, everything you know and love about Excel works just like you’re used too. No more exports or manual entries required. Velixo Reports always gives you up-to-date information. Thanks to Smart Refresh, new data is updated quickly, allowing you to refresh even the most complex report in just a few seconds. We won’t judge you if you only use it for your P&L, but any spreadsheet that requires GL or PM data will benefit from Velixo Reports. Cash flow statements, sales dashboards, budgets, allocation and accrual calculations, intercompany sales eliminations, project progress reports are just some examples of what our customers have created with Velixo Reports. Charts, graphics and KPIs can also be incorporated easily into any spreadsheet. Automatically email, export, or share multiple versions of the same report with a single click. Report distribution is customizable so you can include different tabs or set specific parameters based who’s going to receive it. Easily output as Excel, PDF or Values. For more security, we’ve added the possibility to optionally password protect the files. Create and post GL entries without leaving Excel. The content and amounts of the GL entry can be dynamic and based on Excel formulas. 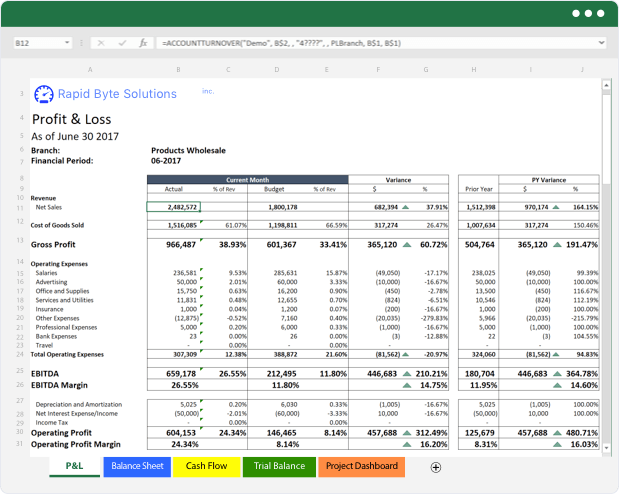 Moreover, you can retrieve multiple budgets and forecasts and report them in Excel. Simply adjust the number or apply your own budget model and write back the modified budget straight in Acumatica. Right-click on any cell and get detailed insight into the data referenced in a calculation. You can drill all the way down to the original document in Acumatica and review any note, activity or file attached to it. Smart Drilldown lets you analyze formula cells that reference other cells, such as a Gross Profit or Net Income calculation, and will even show you where the Velixo Reports functions were found. Smart! Multiple companies, multiple tenants, public cloud, private cloud or on-premise installations of Acumatica – Velixo Reports can consolidate your data in a single Excel spreadsheet while maintaining full history. If you can access it from your web browser, Velixo Reports can connect to it. Use the same login and password that you use when connecting to Acumatica from a web browser. You can restrict access to specific roles and users. Branch access rights as well as account and subaccount restriction groups are also applied, allowing you to control who has access to what. If you know how to use Excel, then you can know how to use Velixo Reports. As easy as Excel, as powerful as Acumatica Analytical Reports. Grant access to anyone who needs it, at no extra charge. Give your whole workforce the benefit of up-to-date information. Data is loaded & refreshed in a matter of seconds. Velixo Reports is sold exclusively through the worldwide network of Acumatica partners. As a Velixo partner, we’ll provide you with new opportunities as well as our resources to help you build your expertise, and grow your business. 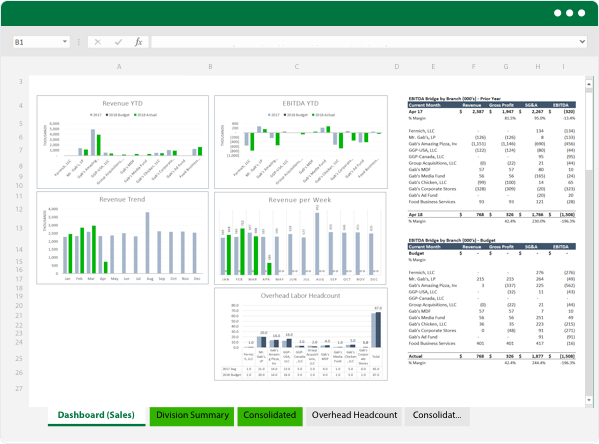 CFOs and controllers love Excel, and as one of the world’s most popular application, it’s everywhere. Velixo Reports is a must-have for any Acumatica user that spends time in Excel. Include it with every new implementation or upsell your existing customers. We help you build a predictable revenue stream through our generous partner program that reflects your expertise and level of commitment. No direct sales. Our partners are at the center of our business. We offer you a true partnership with a market-leading solution and provide you with excellent training and ongoing support.